I've been blogging regularly for 4 years now. 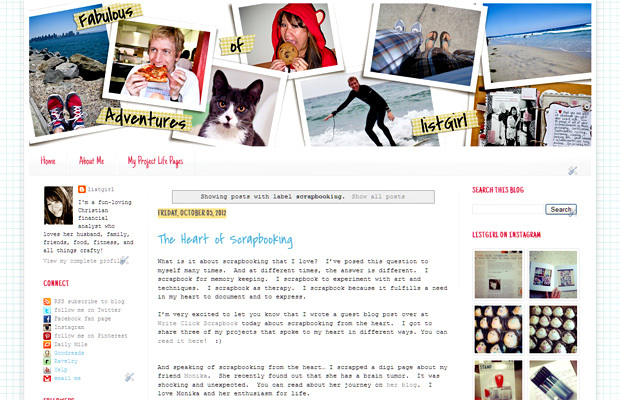 My blog is actually my main source of memory-keeping, along with sharing of my scrapbooking and crafting adventures. I have loved sharing on my blog and loved the community and friends I've made because of my blog. If you look at the "About Me" page above, you can read what I'm all about. I love writing, scrapbooking, paper-crafting, running, eating, and my friends and family. My blog has been all about these things and more. Over the last 4 years, I've made blogging my priority and have put in a lot of time and effort into regularly writing posts for my blog. This past week, I almost quit blogging. At least, I thought seriously about taking a hiatus. Over the last couple of months, I've noticed that blogging had become sort of a chore. I wasn't getting as many comments as I used to get on this blog. While that is certainly not the over-riding reason why I blog, it was fun to have feedback about the different types of things I blogged about. Lately, I had been getting the feeling that I've been talking to myself. And really, talking to yourself is no fun! I've talked to other bloggers about the diminishing comments, and they have experienced the same. We have discussed some possible reasons why blog commenting seems to go the way of the dodo bird. Some reasons mentioned were Pinterest, reading blogs on mobile devices, shorter attention-spans, etc. I think all of these are contributing factors to the diminishing blog comments, but there's really no solution to them in general. As a regular blogger, I'm putting content and sharing my life out to the blogging universe. Most bloggers who blog are sharing their projects out of the love of sharing and the community. Most bloggers don't actually make any money off of their blogs. So the love of our craft, love of blogging, and the community that blogging creates, is all we have. We do it because we love it. We spend time taking photos of projects, processing them, and writing our posts. This is time that could be spent doing something else. For me personally, it was time that I had to find during the evenings and weekends, since I work full-time as a financial analyst. What made my blogging worthwhile to me is how much I love going back to read my own posts and all the memories I've made and kept on this blog. It's also very gratifying that my husband Todd loves reading my blog. Another thing that makes it worthwhile is having readers who provided feedback and comments on my posts. I don't make money off my blog, so the intrinsic value for me is intangible. It is simply that I need to feel like blogging is gratifying to me in some way or another. And lately, it hasn't felt gratifying. I feel like I spend time and effort on my blog and I just hear crickets. I felt very discouraged. Is anybody reading? Why would anyone care about my blog? I had a discussion on my Facebook wall this week amongst my scrappy friends, and here are some things that were brought up. "I hear ya, I definitely have had more than a few posts where it feels like it's me...hanging out, by myself, with only the crickets, LOL But I don't know if you can necessarily blame Pinterest. In a lot of ways it's like digi galleries - the views are never going to equal the number of comments because there are lots of people who won't comment for a variety of reasons. That's true for even really really huge blogs. They may only have say 100 comments when they they have tens of thousands of page views. It's just how it goes." "It seems to me the only thing you can control long-term is yourself. If you want to continue to enjoy blogging, you need to control how you think about it - separate the process from the praise - and not worry about anyone else. There can be intrinsic value in continuing to blog, if you allow there to be. Even though you don't have comments, you have page views. It means people are seeing your posts (or your stuff on Pinterest) and liking it. You built a reputation for being creative years ago, but you're continuing to maintain it now. Additionally, you're helping other people to figure out how to do something they didn't or couldn't do before. Knowing that you're touching those readers' lives, whether or not they express their thanks, has to feel good inside. You are improving the world by putting more good things out into it than bad." "People don't comment as much as they used to. Myself included. I used to comment on almost all of the blogs I read but don't anymore. I also don't read as many blogs as I used to. I always ready your blog. Most of the time I'm reading from my phone and it's a pain to comment using my phone. I normally will go back and comment later when I'm on my laptop." After the discussion with my friends, and my husband this week, I had almost decided to quit blogging for a while. They are right. The only thing I can change is how I myself feel about blogging, even if nobody is reading or commenting. And I just wasn't feeling gratified when I felt like I was talking to myself. That was Tuesday night. I am so one of those people that read (and still reads) your blog regularly and doesn't comment. I believe I may have commented once. I want to comment, I think of awesome things I would say but I usually am grabbing some reading in little snippets and run out of time for the good intentions I do have. But I love what you share and I looked forward each week to see what cool thing you did on your Project Life pages. Honestly, when I saw you had posted a PL post, I worked some time on my computer with a cup of coffee or tea to see what fun little touches you did. So sorry for never letting you know how much I really love your work. But I break out of my not commenting trend to reach out to you and see if you are still doing PL because I miss seeing them, since your last post I have been checking weekly hoping they would show back up. Or that you were busy and would post a bunch at once. No matter what I hope you are still doing them because they are amazing and what a gift to be able to look back on in the years to come." You know you can't stop. How would I ever know what you've been up to? I had 770 hits last month on my blog...with maybe 6 comments total. The cricket sound gets old. When I've talked to my family about stopping, the kids say, "no way". But, they may not win out this time..
Christine- I could have written the letter from one of your other readers word for word. I've been a long-time reader of your blog, although you've probably never known! :) I most definitely appreciate your hard work in maintaining this blog (especially because you work full-time too). Your projects, creativity and life adventures never fail to inspire me. I'm sorry I've never said that to you before. Please keep blogging! I stopped blogging in 2009, mostly because I couldn't keep up with children, a full-time job and some basic form of memory keeping, let alone blogging about it all. I miss it...even though I had few readers, I miss having those posts for myself. So please, only stop if YOU don't enjoy it anymore because I'm positive there are oodles of readers like me out there too who appreciate your work (even if we don't say so). Anyway, thank you. :) I'll try to be much better at coming back again soon! What a sweet and encouraging email. I'm glad she decided to share that with you. well i imagine you are going to get a lot of comments on this post. i'm not a commenter - i read through google reader and very rarely click through. anyhow, i enjoy your blog. i'm a fan. i love reading about the places and things you are doing. i love the you have embraced hybrid and i enjoy your pl pages. so i'm glad you are continuing. I read & enjoy all your posts, Christine. I don't comment on every one, but I do read them, albeit sometimes a week or so after they're posted! I've taken a break from blogging myself. I would really miss reading about your life, seeing your wonderful photos and being inspired by your creativity if you decided to stop blogging. Please take heart from the number of pages views you get, Christine. You're an amazing story teller and don't ever feel like nobody's reading ... we are! I completely understand if you need more "you" time and less blog time. But know that I love reading it! I hear you. I seldom get any comments anymore but you know what it doesn't matter. I print my blog out into books when we have the extra money and I love that. I have a journal of our life for my son, my blog. So far I've been able to print it out to 2009...hopefully soon I can start on 2010...We love to look through the blog books and see our past adventures. Wow Christine, I think you've said things that a lot of bloggers have probably thought at some point. I don't blame it on Pinterest per se, but I think a lot of people find it easier to push that "pin it" button than to post comments. I really like what you do with your Thanks For Pinning Me board. It probably doesn't make you feel as good as a comment, but it shows that you definitely do have a following out there. I think even seeing your page views isn't a good indication of your readership because a lot of us probably read it via rss or Flipboard or something similar. I read your blog but I'm not one who comments. I can never think of anything clever or worth saying. But I refer to your blog to get inspiration for PL. I've been trying to get started on it for 2 years now. Hopefully once my office/craft room is set up, I can get started. My friend and I were just talking about how your posts were getting less frequent. We, like many others, never commented on your posts, but I can assure you we thoroughly enjoy your blog. As someone you've never met in person, and in all honesty probably never will, I want to say thank you for the inspiration you've given to me and allowing me to be a fly on a wall to your and Todd's (and Noodle's) exciting lives. I LOVE your blog, love your photos, your posts are always so inspiring! :) Sorry for not commenting more often, but I always look forward to your posts. :) Can't wait to read about your PL! Love your blog,Christine. You're one of the last "true" bloggers out there who blog about life and not just product. I admit I never comment though. I read all my blogs on GoogleReader and quite honestly, it's a pain to click through to the actual blog and comment. That's my lame excuse. I'll try to do better....promise!! I too have been a long time reader of your blog. I found you several years ago through digi scrapping and have continued to follow you even though you have moved on to other crafty things. But I have gotten and used numerous great recipes and inspiration from your posts. I used the couch to 5k program to get back into running following a knee injury. I bought my DH the adorable I heart My Trophy Wife shirt that Todd was wearing in a blog post a few years ago. So even though I have only posted comments a handful of times. I have read every post you have made in the past 2-3 years. You are an inspiration to me and I hope that you keep blogging, but I will understand if you need to stop or take a break. So thank you again for the inspiration! I am guilty of only making the occasional comment but read all your blog posts. I generally read them in Reader on my iPad so I have to make a conscious effort to comment... Not always easy with the two year old demanding attention. Keep doing what you do as there are so many of us who enjoy your posts. I think views are more valuable as a gauge of the blog's popularity rather than comments. That is what I tell myself anyway! Great post. I know I used to be a far more regular blog commenter than I am these days but with work, pregnancy and everything in between, I have become more of a reader than a commenter too. It is unfortunate because we all love comments and your blog is a great reminder to the rest of the blog world to make sure we're known instead of just lurking in the background! Christine, I first started following your blog with the whole New52 thing. It was a great adventure following what you and others were doing. I also learned so much about you, scrapping, and SD in the process. I too am guilty for being a regular reader but not stopping to comment. I follow your blog through my blog reader on my iPad and I just don't take the extra step to comment on all the various blogs out there. I even stopped commenting on giveaways. Just wanted to give you words of encouragement and hope you continue to blog for many more years to come. I find your stories to be valuable and humorous. Smiles and hugs. Oh, if it wasn't for you, I would have never tried point loma seafood. Delish! I've been following your blog for awhile & I read it whenever I get a chance! I'm sorry I don't always comment, but I love seeing what you're up to & I especially love all your projects, they are such an inspiration! I know what you mean about the comments, it can be discouraging, but I think they come in waves. Linking up places helps also. Good luck & I hope you begin to enjoy blogging again. I JUST started reading your blog (this is like, the 2nd post that came up in my Google reader), and I wanted to let you know that I'm so glad you're going to keep blogging! I have heard about you through the Digi Show (and bookmarked a few of your posts for later perusal)... and the when you were spotlighted on Write. Click. Scrapbook., I decided that I really should just add your blog to my Google Reader. I'm one of those people who is usually too shy to comment on blogs, but after reading your post, I'm going to try to be better (not just on yours, but on all of the personal blogs I read!) Thanks for the reminder. Hi Christine! I have been reading your blog for a long time, but never commented :( Didn't know bloggers liked it that much! Anyhow, I am always looking forward to your posts. I live in Ohio, so I feel like I have some connection to you (go OSU!) and whenever I see all the beautiful pictures of California and the food it takes me on a mini vacation from my desk job. Keep it up, we're still watching you! I'm not a blogger but I do appreciate the time and effort bloggers put into their content. I'm not much of a commenter either but I will comment if I need to. You may not realize how many people follow you and don't comment, like me. I love the food pictures you take and I love your project life updates. So don't be discourage, remember to blog for yourself first, entertain yourself and you will entertain others. I'm one of the lurkers who has been following you a long time. Always looking for a pl post because I love them. Love to see all your scrappig projects and read about your adventures. I'm sorry I did not comment so much. But trying to keep up with everything the scrappy world is sharing takes up a lot of time. So commenting seems less important. But I hope you'll keep those post coming. Will try to comment om them, but I'm always reading and looking for PL stuff. Bye Irene from the Netherlands. I'm also a long-time reader and am guilty of never commenting. I just want to reiterate what everyone else has said before me, please do not stop blogging. I really appreciate every single one of your posts, especially the ones where you're out and about. I'm in the UK and the only sunshine I get to see is the one in your pictures!! Your scrapbooking is amazing and such an inspiration. Please remember that you're not alone, and we all value your lovely posts. Looking forward to many more posts (and the PL story, this one sounds very intriguing!). Take care, Sol. I can honestly say I've been overwhelmed by your comments and emails. I admit to shedding a few tears. You are right, I need to enjoy blogging myself, but having people who read my blog and are inspired by my posts in one way or another, inspires ME. Thank you so much! I enjoy your outlook on life and living an adventurous life style. It encourages me to try different things, whether food, running or scrapping. And I'm happily married sans kids so I like to see what you guys do with your free time too! I hope you continue your blogging journey and thanks for bringing this to our attention. I can make an effort to comment on many more blogs I read almost every day. Take care and yes bring on a Project life post. They are always inspiring to read. Guilty! I've been reading your posts for maybe a couple of years now and maybe commented once or twice. I'm sorry! Really love your posts especially your PL posts because like you we do not have kids and i am also in the same profession as you, and me and hubby loves to eat out! so, you can see i get so much inspiration from your PL posts. What I love most about your blog posts (and PL journaling) is your style of writing...simple but truly describes your feelings or whatever story you wanted to tell. Whenever I get hang-up on my journaling, I would go to your posts to remind myself that I just need to tell my story and not win a poetry award. So, thanks for the inspirations! 1. I found you from searching for blogs posting about PL. I stuck around, checking in weekly, because I enjoyed your PL style. In time I became interested in your other topics too and read more posts than just the PL ones. 3. I miss your PL posts. I was so disappointed when I caught your comment on Instagram - I think it was in response to Amy T. saying PL was only going to be a six month project for her... and I was so bummed when I saw you echoed her thoughts. 4. My blog is of a totally different topic and genre, and while my traffic steadily grows, the number of comments has slowly dwindled. I'd feel like I was talking to crickets too, but Sitemeter and analytics would indicate otherwise... so on I go. 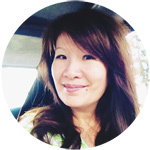 Christine - you are one of my favorite bloggers. I look forward to your posts and enjoy each one. Commenting is difficult for me now that I use Feedly as my reader. It just doesn't offer an easy way to do it other than go over to the actual blog which is another step. So, I rarely post comments even if I'm enjoying what I'm reading. I hope you'll continue to blog for as long as it makes you happy! Know that you have faithful blog readers who love your posts! Oh dear, you fall off the blog reading bandwagon and miss a post like this! I'm doing some catch up while I'm laid up recovering from the flu. While it stinks being sick, I'm glad I came by to check up on what you've been up to. I have to say I really love each of the aspects of your blog. As a former NorCal resident, while my hubby was at grad school at Berkeley I find the posts about CA life enjoyable. I regret not visiting SoCal more. I like your scrapbook pages and stuff because I admire your style and I hope you will continue to share both. I have blogged since late 2008 and to be honest I have been thinking about quiting too. Since I do some reviews and commercial stuff - although not enough to compensate the amount of time put into such efforts, it does become something that seems like job with deadlines and stress. It will seem like I spend too much time on bloggy "stuff" as opposed to living life and crafting. I've refocused lately and been enjoying a better balance. I have also noticed the drop off in comments. It seemed like when I started, I had fewer readers but the ones I had I really knew. I've become friends on FB, email them offline etc. Now it seems I don't have that connection with them anymore. This also has made me feel I am talking to myself. So I've made an effort to go out and respond more and comment more on the blogs I read and enjoy. It makes me feel at least I am talking to someone, who shares the same interest in scrapbooking and memory keeping :) Plus I have been guilty of being a "lurker" who reads and never comments and it's been my goal to share my admiration and support for the bloggers I visit regularly. Possibly for reasons like you've pointed out, I certainly wouldn't want you to stop writing because I never bother to say, "Hello!"